spectator, and Ricardo enjoyed the time she spent with her father. Every day at the track, she drooled at the chance to be in the race, but never found the opportunity to do so. She hoped to be behind the wheel as a driver, not on the sidelines watching the cars go by. Ricardo was always being pushed to become a horseback rider because all her cousins were involved with horses. But she knew horses couldn’t go down the racetrack she envisioned. It is important in life to make your own footprints, not following others. And that is what Ricardo was doing, following in her cousin's path, not making her own. When she was 15 years old, her cousin purchased a sprint car and began racing – this allowed Ricardo to come back to the track. Having the love for racing, Ricardo would go to the races with her cousin and help out, changing tires, working on the car, allowing her to become involved in something that filled her heart. After a few times assisting her cousin with his race car and hanging out at the track, she was hooked. You couldn’t drag Ricardo away from a sport she knew was her future. You find Ricardo at the track every weekend, and she contributes the love for racing that has kept her focused and out of trouble. Every chance she gets, Ricardo expresses how important it is to help steer young girls and boys away from the dangers of falling into the wrong group of friends. Then it happened, one weekend – her cousin gave her the opportunity to get behind the wheel and let her drive his racecar. Well, you can imagine what happened after that first drive – she was hooked. At that moment, Ricardo knew this was her calling and couldn’t imagine doing anything else. Her sights were higher. She did not want to drive a sprint car, Ricardo wanted a late model because of the weekends she would spend at the race track watching the late-model cars go around and around, thinking those were the coolest things. There was work for Ricardo to do, and that was convincing her father to allow her to race and purchase her first racecar. He knew his daughter was serious after weeks of begging. Her mother at first protested Ricardo’s desire to race, but soon came around once she observed her passion for racing. Ricardo and her father teamed up and searched all social media outlets to find that perfect racecar. After six months, they came up empty, until she met up with Mayham motorsports. That is when her dreams began to come true. Multiple state racing has kept Ricardo busy, but her dream is to race in NASCAR one day, and she will tell you, “This dream will come true”. She stays focused and driven to fulfill it. Another goal is to host a camp for younger kids, where they can stay for a week, she can train them, and give underprivileged kids the opportunity to sit in a racecar and drive a smaller version. The camp would be a place that could offer these kids something to focus on and develop a passion for. Ricardo wants the camp to help these children develop goals and work toward them. Ricardo has her sights set fast and high. With her internal energy, she will conquer. 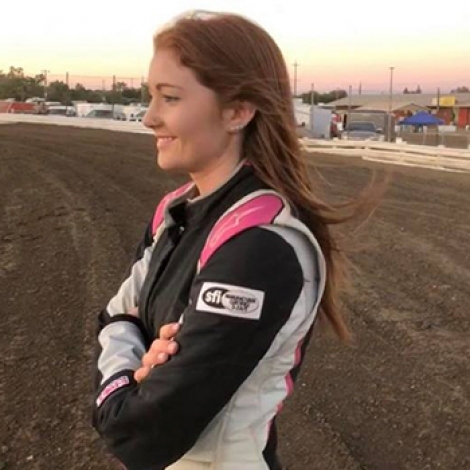 During her travels on the many racetracks, she will hunt for future sponsors to help fund this camp and help keep racing alive for years to come.